Traditionally surgical treatment was the only effective treatment for varicose and spider veins, but the role of surgery is undoubtedly being re-calculate with the development of other new treatments over the last 15 to 20 years. Surgery still has the place in the treatments of varicose and spider vein, but the modern varicose vein treatment procedures and techniques has definitely lessened the importance. Though surgical procedures are old and good but the new laser treatments are more effective in fading away the spider vein without the hard and long procedure of surgery like EVLT has its own importance for varicose and spider vein treatment simultaneously. 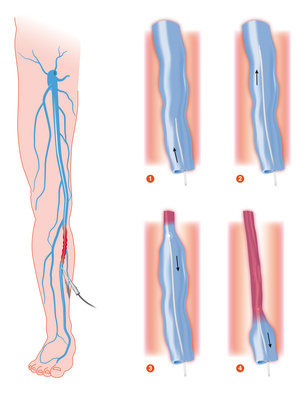 In general the more pronounced the varicose veins the greater the benefit from Endovenous laser treatment. There are several more treatment procedures are introduced for such treatment like sclerotherapy, laser surgery, phelbectomy, endovenous ablation therapy, endoscopic vein surgery, vein stripping and ligation. The most effective EVLT eliminates the unsightly varicose and spider vein with no hospital stay, minimal to no scarring, no lengthy recovery and no side effects. In less than an hour you can be free from twisting, bulging varicose vein and back to enjoy the everyday activity. The EVLT procedure is safe, fast and effective with this treatment you can show off your legs again. The EVLT procedure uses targeted laser energy to seal the vein shut help you to feel better with fastest recovery. The doctor uses ultrasound to map the targeted vein, local anesthesia applied for the procedure, a thin laser fiber is inserted into the vein and laser energy sealed the damaged vein. After the procedure doctor advised to walk immediately, daily activities can be perform routinely only heavy activities like GYM is advised to avoid. The surgical procedure is done for severe cases, the procedure involve tying shut and removing the vein through cuts in the skin. A patient will be given general anesthesia during the procedure, vein stripping usually done as outpatient procedure. The procedure time is almost 1 to 2 hours. The recovery time from the procedure is almost 1 to 4 weeks.